With the 2019 VAFA season just 11 days away, the Hampton Rovers Football Club will launch the new season this Sunday afternoon at Hotel Brighton. The club invites all players from our five senior teams, plus partners, family, officials and supporters. 3pm start at our proud sponsor Hotel Brighton (Upstairs Deck Bar). Entry is FREE for players who’ve paid their 2019 subs, sponsored players and paid-up club members. Otherwise, entry is $15 and tickets can be pre-purchased on the Rovers Online Shop. Includes finger food with drinks available at bar prices. Hear from the 2019 captains, coach & president, in what is a big year ahead for the club as we celebrate 90 years. RSVP to the Facebook event and either pay your subs/membership for free entry or purchase your tickets today. We look forward to seeing everyone there! In practice match action over the weekend, the Seniors defeated Prahran Assumption by six points at Assumption College, Kilmore, with Sam Bradford kicking four goals and singles to Curry, Folino, Miles, Crisp and Kneebush. The Reserves fell short by seven points, the U19s defeated Williamstown by 53 points and the Senior Women lost to Oakleigh by 12 points. Positive signs for all sides ahead of the season. The Seniors wrapped up their pre-season campaign on Thursday evening with a solid 48-point win over Hampton Hammers at Peterson Reserve. Meanwhile, training will revert to Tuesday’s and Thursday’s as of next week at Boss James Reserve. The club will again field five teams in 2019 – Seniors, Reserves, Thirds, Under 19s & Senior Women. 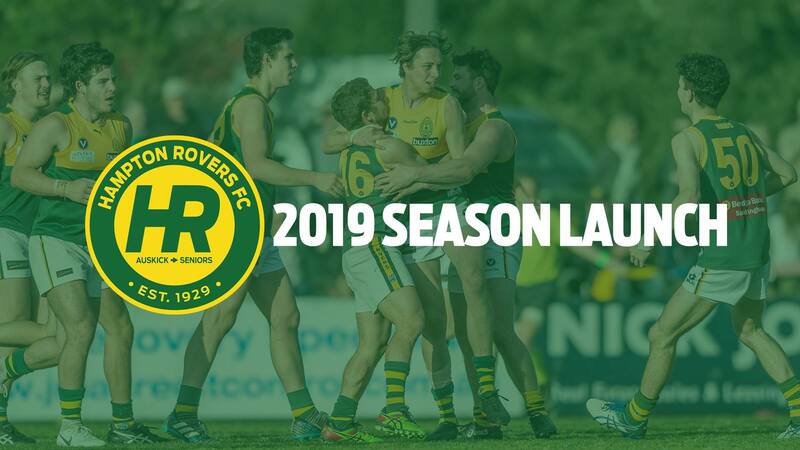 The Rovers are away round one (April 6) against Old Mentonians and take on Ormond in the first home game of the year on April 13 – tickets are now on sale for the first Home Game Luncheon of 2019. Rovers Gala 2018: Major whole-club function this Saturday!